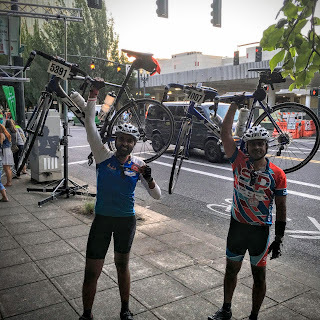 This was my third attempt to complete the Seattle to Portland ride in a day. I started training for this year STP pretty late. I was in India till end of March and came back to Seattle only by April first week. By then my other biking friends have already started training regularly. I had not touched my bike since finishing last year STP. Big events in life during winter, we welcomed our little angel Swara to this world. Catching up on sleep was a big fight, so riding the bike was almost impossible during that time. When I came back to Seattle, Sakthi & Swara stayed back in India for a few months to spend time with the extended family. So that gave me time back. I had a single goal this year to focus on complete this year STP in one day before the announced cut off time of 9pm. 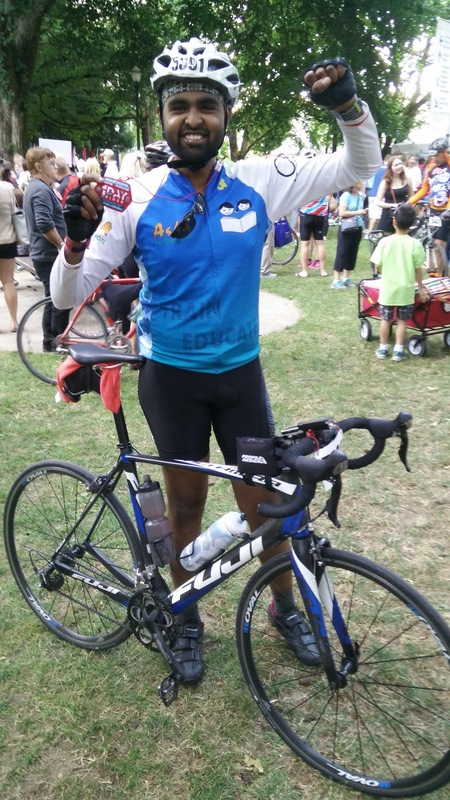 By the time I started my first ride in the saddle, my training group had already done a month long of rides. So I had to start on my own to manage even a 25 mile ride. I also had gained some additional pounds last winter, and fitness level was near zero. My first ride was just 8 miles and I could barely touch a 10 mph speed. 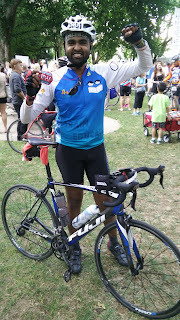 After the first ride, I was contemplating whether I should be planning for a two day STP this year. But I slowly started to add miles every week, and I started to track every ride through my sports watch and logging them in Strava. Last year I did not pay much attention to tracking my stats post the rides, but this year I started to get into details of my post ride stats. One of my past colleague and friend Tim, was training for RAMROD, and he was giving me tips on routes as I started to pile more miles by May. My first challenging ride I signed up was 7 hills of Kirkland century route. This had about 6000 ft elevation gain and about 11 hills to climb. I averaged only 12.2 mph but was able to complete the ride in about 10 hours of total time. Climbing those hills gave me some confidence, which showed up immediately in this year Flying wheels. Even with added elevation to the usual route, I was able to average 14mph and was able to complete the century route in about 8 hours and 22 minutes of total time. By June slowly I started to add more hill training, and I started to enjoy the challenge of climbing. The first extensive climbing I did this year was at St.Helens, in the event Tour de Blast. This was quite a challenging ride with 2 big categorized climbs of Cat 1 & 2, with 10000 Ft of total elevation. But completing this event gave me huge confidence boost. I also started tracking my food intake to pull down my weight for better performance. Before STP in July , I managed to shed about 15 pounds and ride ~1500 miles with some good climbing practice. Now coming to the D day, unlike last year, my friend insisted on starting the ride at the start line which gave a nice feeling to begin. I had a slow start with 2 other friends, since it was still dark and I was struggling to see the road with and the lights were not very helpful. By the time I completed the first 10 miles, it was 5 am and it was getting bright. I slowly picked pace in the at Sewards park hill, where I could drop many people. I joined a pace line which was averaging 19-20 mph and followed them till the first stop at REI. To finish early my plan was to not wait in rest stop more than 10 mins. I reached the first hill at Puyallup. With good hill training this year, the Puyallup hill was a very comfortable climb where I dropped many other riders as I went up. At mile 55, I joined a great pace line who were doing this STP as a practice ride for RAMROD. They averaged 20 mph, and they were kind enough to let me stay behind their pace line. I also stopped only at those places when this group stopped and was able to reach the midpoint at Centralia by 10.40 am well before my planned time. I had average 17 mph for the first 100 miles, my fastest 100 miles every. I took a little longer break in Centralia and took a massage to ensure I don't cramp in the rest of the ride, so I missed the earlier pace line. I left midpoint at 11.30 AM, and joined a group of 3 friends and maintained a steady pace of 18 mph. This year, the rolling hills over the next 44 miles was a fun ride. Unlike last two years, I did not have the fear of seeing the small hills and slow down drastically. I attacked every hill and went past them. I crossed the Lewis & Clark bridge by 3pm and joined one other lady called Sonia. We kept pulling each other for the rest 50 odd miles averaging 16-17 mph. It was 6.45 pm when I entered Portland, ( in 2015 I reached Portland at 10 pm). 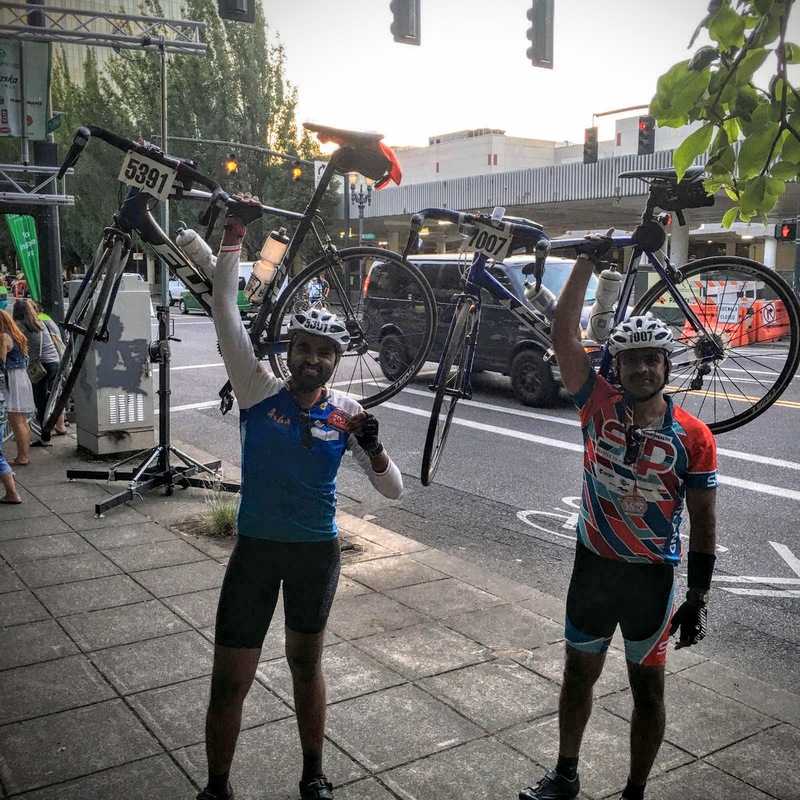 With so many signals and traffic, I crossed the finish line at 7.20 PM with a total ride time of 12 hours and 50 minutes averaging 16.1 mph over the 206 miles. The best part in this, I was feeling good and could continue ride for some additional miles. Thankfully I did not have any mechanical problem or flat tires this year. It took me 3 attempts to have a strong one day finish STP. You can see my full ride stats here in Strava. After 206 miles on the saddle!!! On the fund raising part, raise money for educating kids in India through a non-profit. Over the last 2 years with the help of friends & family we sent more than 15 kids to school free of tuition fee for a full year through Isha Vidhya and Asha for Education initiatives. This year my goal was to raise 1000 USD, and with all your help and support we raised 1190 USD without adding up the matching contribution from corporates like Microsoft , Amazon etc. My heartfelt thanks to my family, friends (especially Tim), Team Asha bikers and also those great pace lines who supported me in the 2016 STP journey and also contributing generously to Asha for Education. Looking forward to biking more on the saddle as I explore those unexplored routes, and climb those great mountains. Thank you!! !